Friends got together to launch a new initiative helping older people retain their independence in Larne. 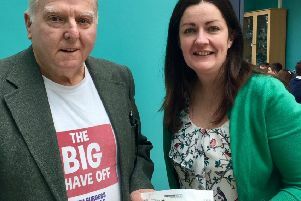 Larne Community Care Centre’s Link Project ‘Friends Together’, supported by the Big Lottery, was unveiled at an afternoon tea celebration in the Town Hall. Barbara Ann Gilchrist, who is the co-ordinator for the project, explained: “The Big Lottery will provide funding for our new Link Project to deliver a three-year programme of social activities, social intervention support visits and easy access to important age-related services to support older people in Larne and surrounding areas. A further element, added Barbara - who is also co-ordinator of Good Morning Larne which offers a telephone befriending service for older people - is the provision of volunteering opportunities to positively enhance the community. “We like to call this Friends Together. A friend is one of the nicest things to have - and the best thing to be. Friends are medicine for the heart and vitamins for the soul and the best time to make friends is before you need them. Guests also heard of a Police and Community Safety Partnership initiative. “We want to tell everyone all about a new service they have, which is a Text Alert service. So the police, along with the Police and Community Safety Partnership, want to communicate better with the people in Mid and East Antrim. Together they developed the idea of a Text Alert system which allows them to get in touch directly with you, by texting you. PCSP representatives were in attendance to answer any questions and register people for the service. Thomas Hamilton from The Music Yard provided the entertainment.